My daughter wanted to work on Living and Working in Space Requirement #20. The requirement has the PiPa build a model of a space station. The girl handbook refers the girls to the Indianapolis Children’s Museum website. They offer a program “Cosmic Quest” which allows you to build an online version. Lily was able to find the Indianapolis Children’s Museum website with little difficulty (here). However, she did not find Cosmic Quest in the children’s section. I thought I would help you locate the program – It is in the Educator’s section – Or can be found here. NOTE: The requirements have been simplified here. Please be sure to read the full text in the Girl Handbook to make sure you fully understand the requirements. 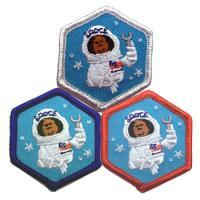 This entry was posted in American Heritage Girls and tagged AHG, merit badge, Science and Technology Frontier, space. Bookmark the permalink.